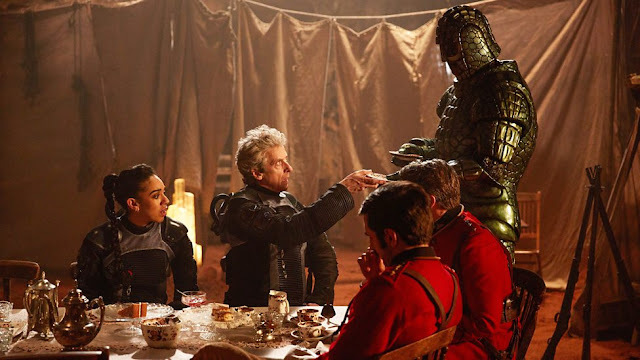 S10E09 - "Empress of Mars"
Arguably the biggest problem facing Doctor Who this year is the show's refusal to "go big". Series 10 has been praised by many as a return to the basic format, but while that worked nicely with episodes one through four, we're nearing the end of the series now and there's a frustrating lack of real danger going on. "Empress of Mars", the latest story penned by polarizing writer Mark Gatiss, is a passable entry to the series, but it's not one you'll be remembering any time soon, and it certainly isn't strong enough to pull the show out of the mini-slump it's been stuck in since we visited a certain Pyramid. In short, the Doctor and Bill find themselves on Mars. Weirder than that, they find Victorian soldiers on Mars. And an Ice Warrior, which soon leads to an Ice Queen and an Ice Warrior hive. It's a story with great potential but, as with most Gatiss scripted episodes, it doesn't really deliver on a lot of what it sets up. The sheer anachronistic joy of seeing Victorian soldiers on Mars with a giant futuristic cannon can only suffice for so long, and Gatiss doesn't do enough to keep things interesting once the novelty starts to wear thin. Credit where it's due, "Empress of Mars" is more focused and tightly wound than the two episodes that preceded it. While dialogue is rarely his strong suit, Gatiss' penchant for great ideas cannot be disputed, and this episode continues that trend. He also succeeds in nicely splicing his episode with humour (although I could've done without the Frozen reference during the climactic moment) and the way the story builds from act one into act two into act three is some of the most seamless plotting the show has seen this series. Gatiss' scripting isn't a runaway success, though. At the core of this story is an interesting dilemma - whose side is the Doctor on when the humans, the race he always sides with, are for once the invading alien? It's a brilliant concept, but one Gatiss seems ill prepared to tackle. His script raises the moral issue, lets it linger on Peter Capaldi's face for a few moments, and then hurries on. Where is the complex mind battle the Doctor must endure to solve this problem? Where is the thought, the emotion, the ambiguity? That speech just last season seems a far cry away from whatever this was. "Empress of Mars" is benefited by its wacky premise, with Capaldi and Pearl Mackie clearly having fun in such an absurd story, but the episode needs something more concrete to really drive its ideas home. "Empress of Mars" successfully builds to a tense final act- helped by the solid direction from Wayne Yip - but everything slowly begins to fizzle, slipping into predictable answers and tidying itself up far too neatly come the resolution. The episode needed something bolder, something to up the stakes. This is a story set on Mars, a story featuring a whole hive of Ice Warriors. It shouldn't have felt this inconsequential. Perhaps it's just me. Perhaps, after the unmitigated triumph of Series Nine, I'm just expecting too much. Doctor Who's tenth series got off to a flying start - it turned the ordinary into something enjoyable again after two series' that felt very different to anything we'd seen before - but everything post "Extremis" has struggled to reignite the flame that was lit when Capaldi stepped aboard the TARDIS. These last three episodes, for me, have seen the show at its weakest during Capaldi's tenure. I guess what I'm missing is the big, emotionally complex story lines. Episodes that allow an actor of Capaldi's talents to really show off what they can do with a role like this. Pearl Mackie has demonstrated remarkable range as Bill, herself a strong character model, so why isn't the show exploring that? At present, Doctor Who seems to just not realise the potential its core cast are offering. "Empress of Mars" is just about fine, but in the series' final act - and the final act for both Moffat and Capaldi - it isn't really good enough. The supporting performances were all round great here. Doctor Who may be under-using its lead stars, but the guest performances all series have been terrific. Anthony Calf, Ferdinand Kingsley and Adele Lynch were on top form. It wasn't hard to tell that this episode was written prior to Nardole joining the core cast. His little thread in this episode seems to be building to something, maybe, but it felt inconsequential here. Even Missy couldn't save it. Out of the nine episodes Gatiss has written for Doctor Who, I'd say this is probably middle tier stuff. His worst is "Victory of the Daleks" back in Series Five, and his best is either Series One's "The Unquiet Dead" or Series Six's "Night Terrors". Next week's episode is written by Rona Munroe, who also scripted the last episode of the classic Doctor Who series. Hopefully she can be the one to pull the show out of this frustrating mini-slump.